Our Hydrogen Safety Test Center was completed in the autumn of 2004 in close cooperation with industrial partners. In this installation, hydrogen distribution and different combustion processes can be investigated at a large range of geometrical and energetic scales. 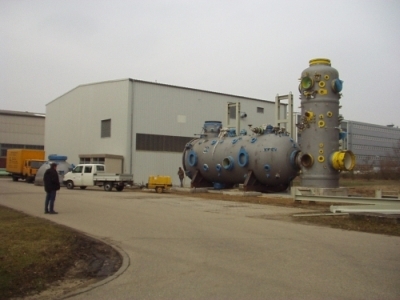 The main components of the Center are two pressure vessels A1-Vessel and A3-Vessel (of about 100 m^3 and 30 m^3) for combustion experiments, and a Test Chamber (of about 160 m^3) for hydrogen release experiments under controlled flow conditions (up to 24.000 m^3/h). to provide fundamental data for the development of hydrogen safety rules and standards. Aside from hydrogen, our group also investigates dust explosions and combined hydrogen/dust explosions theoretically as well as experimentally (DUSTEX). At the moment, this work concentrates on the mitigation of combined hydrogen/dust explosions in the planned ITER fusion reactor.